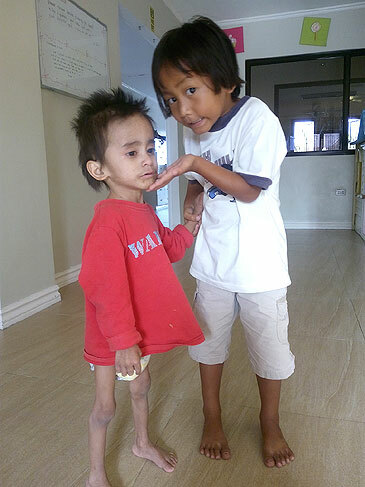 How the child came to Ruel: Grace and Jems was referred by a child caring agency in Silang, Cavite. The children’s mother left the kids to the care of their neighbors who has no means of supporting 2 more kids aside from their own children. Prior to abandonment of the children, they were often neglected by the mother, locking them up and leaving them to their house with no food or drink. Miss I didn't have a chance form the beginning! Number 10 out of a family of eleven there was just not enough food to go around. Miss I got the rice water! The left over water after the rice was cooked. When our staff spotted her on the floor of the small shack where the family lived it seemed that it was simply to late. Pauline gently lifted the baby into her arms and held her. Barely alive, Miss I was taken back and placed in our centre for malnourished children. Doctors examined Miss I and suggested she had about seven days to live. Mr R stared his life as an innocent child playing with his friends in his Manyan village in the mountains of Mindoro Island in the Philippines. Then one day his life collapsed. His mother died suddenly and he was virtually left along at the age of three. Deeply traumatised by the lost of his mother, Mr R refused to eat. While the Tribe were extremely distrustful of any outsiders, they decided to contact the Ruel Foundation and ask for help. This expression of trust was unheard of for this tribe and reflected the work of the Foundation in the village over the last year or so. This wonderful little boy came to us at just a few months old. We love him so much, he is so very cute and funny. This week his new family arrived to bring him home to his "forever" family. It was a sad, sad day for us, but so very happy at the same time.